9 hours Crossrail’s new leadership team has produced a new plan to get the delayed project finished and start rail operations under central London sometime between October 2020 and March 2021. 6 hours Pop superstar Rita Ora will be providing the evening entertainment after a day of horse racing at Doncaster Race Course on 29th June 2019. 7 hours Balfour Beatty has been chosen by Aberdeen City Council for the £25.7m transformation of Union Terrace Gardens (UTG). 8 hours Aberdeen City Council has approved road and transport works totalling £10.6m, boosted by £2.5m of additional funding. 8 hours Local authority urban development company Be First has confirmed McLaren Construction as contractor for an affordable housing development in Barking town centre. 9 hours Osborne has been awarded a £40m contract for the reconstruction of a 1960s office building in the West End of London. 9 hours Wates Construction has been awarded a £7m contract to build a new fire station in St Helens. 9 hours Essex-based Professional Plant Services has developed a compact piling rig for working in confined spaces such as basements. 9 hours JCB is preparing the public launch of its latest X Series crawler excavators, in the 13- and 16-tonne class. 1 day Terex is selling assets as quickly as a newly-relegated football club offloading players it can no longer afford. 1 day Cheshire-based groundworks and civil engineering contractor WPI Group has taken delivery of 16 new Volvo excavators. 7 hours New York governor Andrew Cuomo has announced a further US$280m (£218m) for energy storage projects. 8 hours The Canadian government has opened the procurement process for the country's pavilion at Expo 2020 in Dubai. 8 hours Atkins has won contracts to help reduce flood risks in Texas, USA. 8 hours Belgian manufacturer Recticel has turned down an unsolicited takeover bid from Kingspan for its insulation and flexible foams divisions. UK plant sales remain buoyant despite the threat of Brexit. 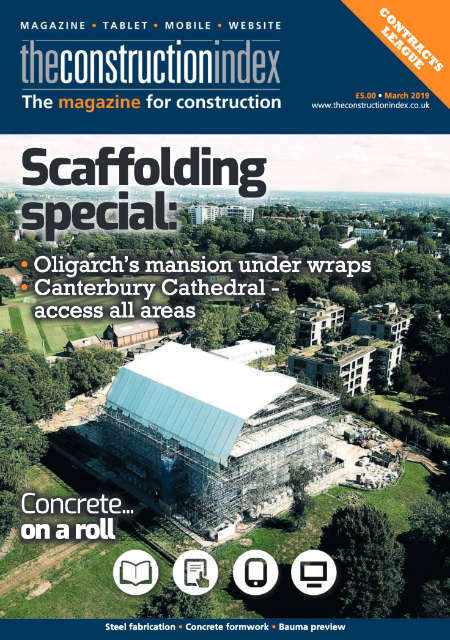 In this special feature, restorers ascend heavenwards at Canterbury Cathedral, while scaffolding specialist battle with high winds in Hampstead. Computer modelling and 3D printing help formwork suppliers create complex bridge piers. And forget about on-site batching - fibre-reinforced concrete is now available on a roll.